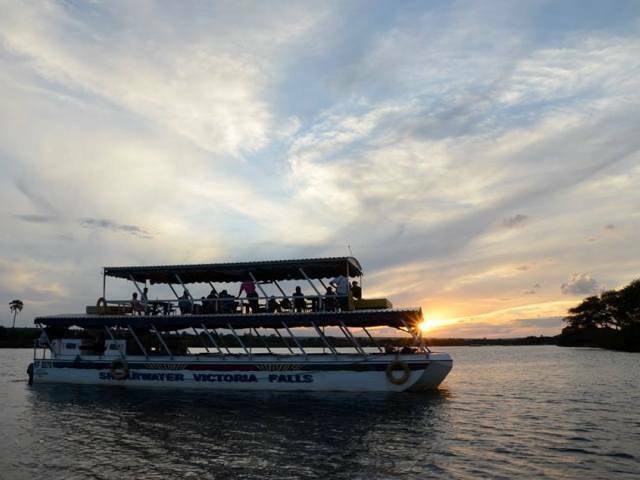 Victoria Falls Sunset Cruise - Which one is best for you? There are many options to choose from which can become extremely confusing. 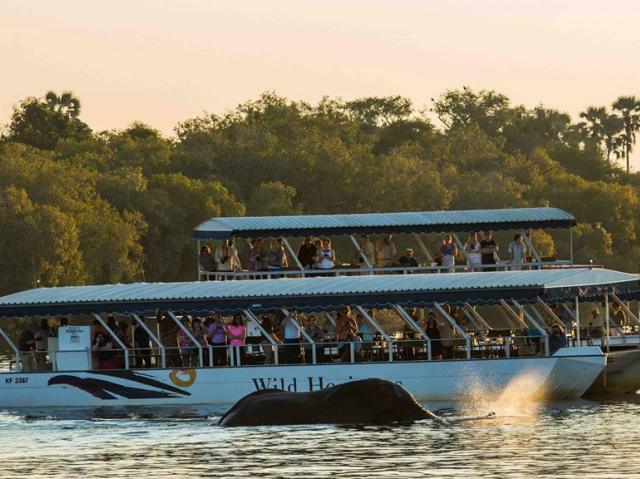 This article addresses that confusion, outlining the sunset cruise and sunset/dinner cruise options on the Zimbabwean side of the river. Jim Harrison once wrote that it is impossible to be unhappy when you are in the middle of a big, beautiful river. We know that there is no river more beautiful, more serene, more mesmerising, than the Zambezi. This river brought David Livingstone to the brink of the Victoria Falls. A river that ripples and rolls through the Zambezi National Park, then cascades down black basalt rock spraying mist into the sky and creating rainbows on a rainless day. 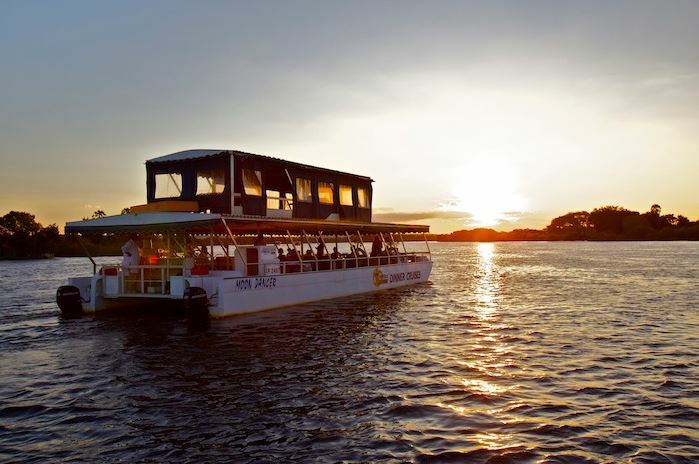 Sunset Cruise trips along the Zambezi are a magnificent and extremely popular way to experience the river. All the boats, bar the jet boats, navigate a 6 km stretch of river above the Falls themselves, shallow waters and hazardous rocks prevent them from venturing any further. Although you do not see the Falls themselves during a cruise, a cloud of spray, visible from the boats, sits on the horizon, crowning the waterfall. This section of river, which starts 3kms above the Falls is placid and wide and dissected with many islands. 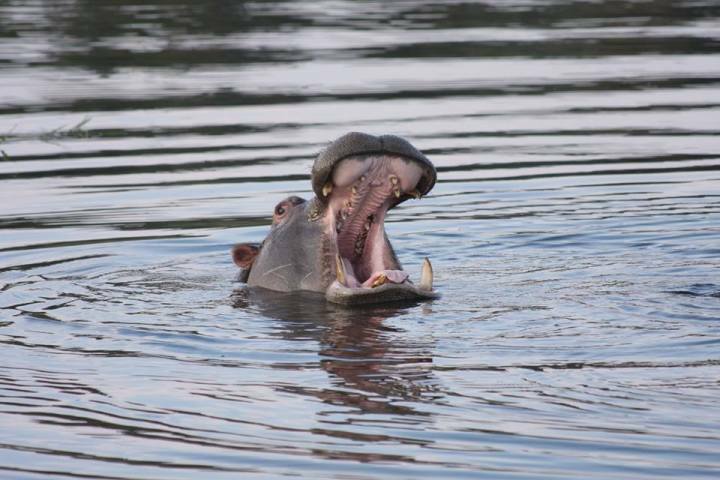 Resident hippo and crocodile are guaranteed sightings, whilst elephant herds are often seen as they cross from one island to the other in search of food. The birdlife is phenomenal and the sunsets are truly unforgettable. Sunset cruises start at 4pm in the winter (May-August) and 4.30 in the summer (September-April). Pick-up from your hotel will be earlier than these times, how much is dependent on the distance from your hotel to the jetty site. Transfers to and from your lodge/hotel are included in the price, and the cruises last approximately 2 hours. There is a variety of boats to choose from, all of which are modestly designed pontoons that let the warm sunset colours seep onto the boat and welcome the cool breeze. Good standard sunset cruises costs start at around $40 including drinks and snacks. An option is available that excludes drinks and this costs $25. The National Parks fees are not included ($10 per person). These standard cruises are sometimes included for free in a package when a number of other activities are booked. The cruises are family friendly and children do enjoy seeing the wildlife and exploring the river. A selection of standard complimentary beers, wines, soft drinks, local brand spirits and light snacks are served on board. A full safety briefing will be given prior to departure, and throughout the trip, the crew will brighten your journey with numerous tales about local culture, historical exploration and the plethora of wildlife around you. The evenings do get chilly on the Zambezi River, so take a light jersey with you, as well as a camera and a pair of binoculars if you have them. These standard sunset cruises are fantastic as they are affordable, get you onto the river and enable you to experience a magnificent African sunset but there are a few other options available that offer a slightly more upmarket and unique experience, these generally range in prices from $60 to $90 per person, excluding the national park fee of $10, continue reading to find out more about these. These boats will take you where the other boats wish they could go. Aqua jets replace the propellers, so the jet boats are able to navigate through shallow waters, that restrict all others, and take their passengers to within 600 metres of the edge of the Victoria Falls. No other boats on the Zimbabwean side can venture this far, so you will find yourself in quiet waters, away from the hordes of other boats, which is quite a special feeling. The distant hum of the river crashing into the gorge creates the ambience of an adventure, while you relax with a cold drink in hand, and meander between the islands, past pods of hippo, flocks of birds, and the herds of elephant. There are three upmarket jet boats, which are also available for morning and bird watching cruises. The “Victoria” is the latest and largest addition to the fleet and is beautifully finished with teak railings and comfortable leather couches. 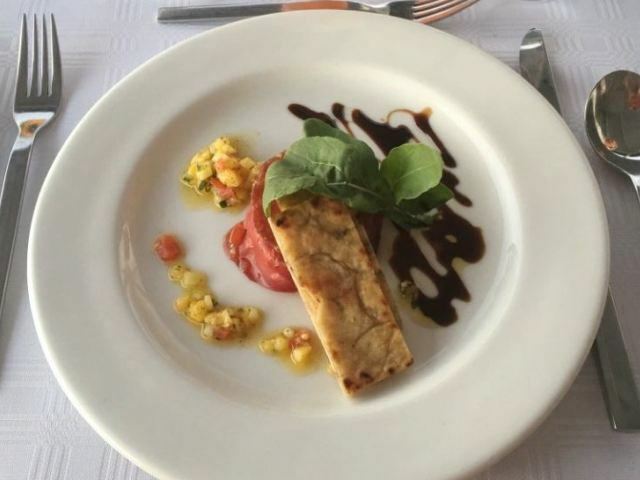 Delicious snacks, prepared by the Victoria Falls Hotel are served along with beverages. This personalised cruise, with a difference, is a personal favourite. 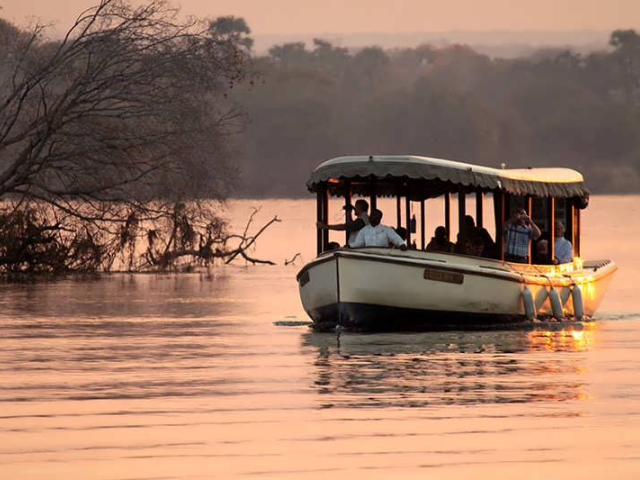 The Ra-Ikane is a small luxury cruise boat named after the guide that led David Livingstone to the Victoria Falls. The boat is styled to resemble a turn of the century riverboat, and boasts a teak superstructure and brass fittings that epitomise Victorian splendour in Africa, there is nothing else quite like it on the river. The Ra-Ikane can carry 14 passengers and is a more intimate and exclusive experience than the standard sunset cruises. Teak tables are dotted around the carpeted floor to fit three people at each, but the open plan allows guests to roam easily between them. The vessel is available for breakfast and lunch cruises as well as the sunset cruise. 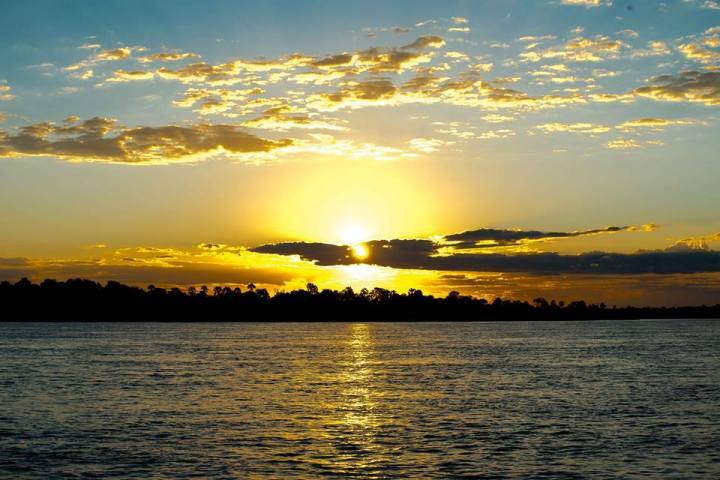 Africa’s five star sunsets are emphasised by the five star service offered on this luxury cruise along the Zambezi. An air of opulence envelopes guests as they step on board to enjoy imported wines and spirits, accompanied by gourmet canapés. The Stairway to Heaven is just one of the white water rapid-inspired cocktails offered on the lively cocktail menu. A cacophony of bird songs establish a natural ambience while the scaly backs of prowling crocodiles cut through the top of the river, and pods of hippo submerge and remerge between the boats. 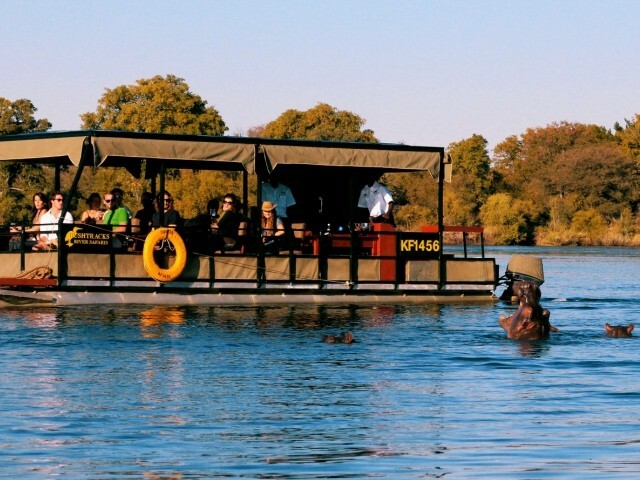 The Zambezi Royal is a single deck boat, which allows it more manoeuvrability to get close to game on the shore or in the water. This is a preferable option for those wishing to be in a smaller group of people. The boat, which can cater for a maximum of 28 guests, does not have a minimum age limit, and children can go on the cruise for half price. 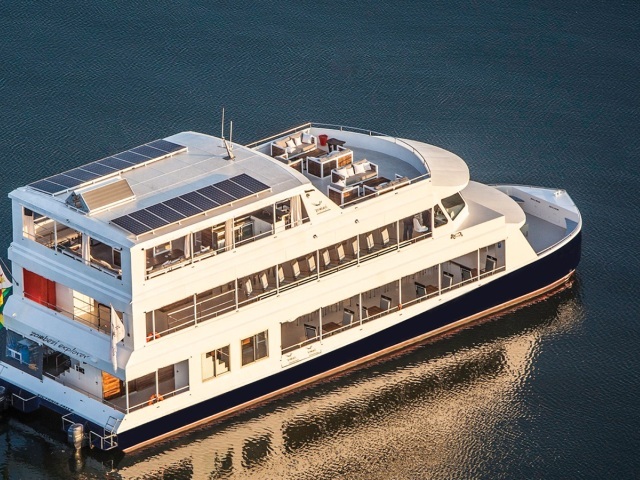 The largest and most extravagant boat on the river is the Zambezi Explorer Cruise Company’s flagship vessel the Zambezi Explorer, which has three deluxe decks. The bottom two are elegant and spacious, with a stylish interior design, well-equipped bar, and hot and cold canapés. What sets the Zambezi Explorer apart from other cruise trips is the extravagant uppermost “Signature Deck”. Comfortable deep-seated couches overlook the river, while gourmet hors d'oeuvres and premium beverages are served from a private bar. Guests on this deck receive VIP treatment. On special occasions, the vessel can be chartered for dinner cruises, but only in combination with a sunset cruise. A select few of the luxury cruise boats have been issued licences to offer a sunset cruise followed by dinner on the river. Enjoy all that a sunset cruise has to offer then after the sun has disappeared below the horizon, you stay on the river and enjoy a meal while you survey the stars that take its place. 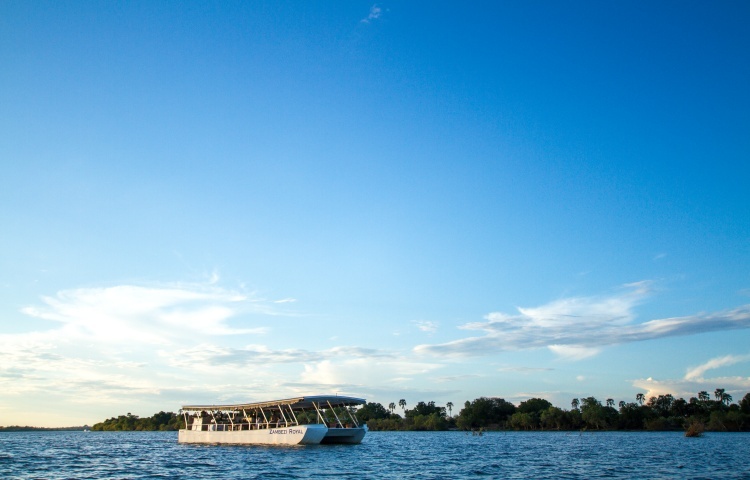 Dinner cruises will show you that the sky is just as much of a wilderness as the vast African plains. It is hard to tell where the river ends and the night sky begins as you cruise quietly along in a blue and silver world, indulging in exquisite food and wine. These cruise boats are extremely popular and for good reason as they offer great value for money, combining a great activity and a sumptuous dinner in one. The three boats available can be seen below and the price is approximately $70 per person excluding the national park fee of $10. The Zambezi Reflections is one of the three vessels owned by the Zambezi Explorer company. 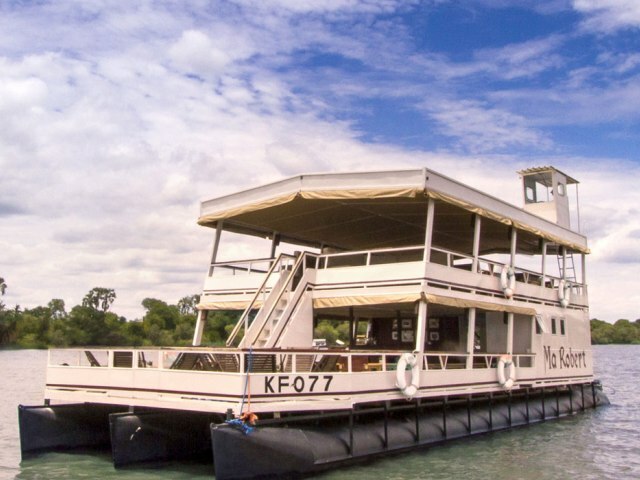 Also known as the “Floating Restaurant”, this single deck vessel which can seat 34 passengers, offers gourmet meals on the Zambezi River. The Zambezi Explorer Company standards are high and your meal and experience will most likely exceed expectations. 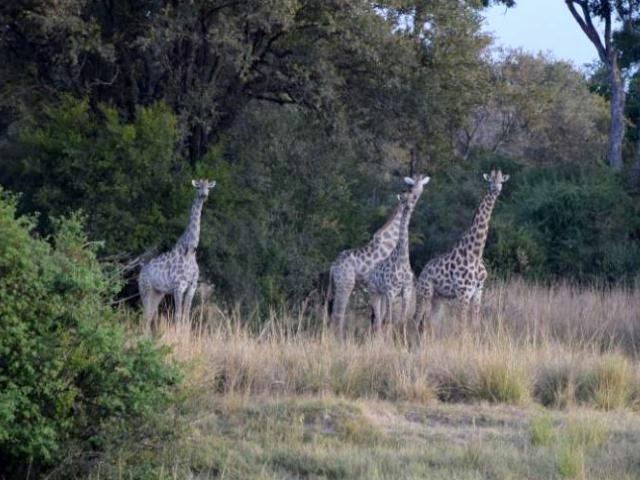 Into Africa Bush Cuisine, operate three vessels of varying sizes for breakfast, lunch and dinner cruises. The family owned and operated company can tailor the menu to suit the dietary requirements of guests. 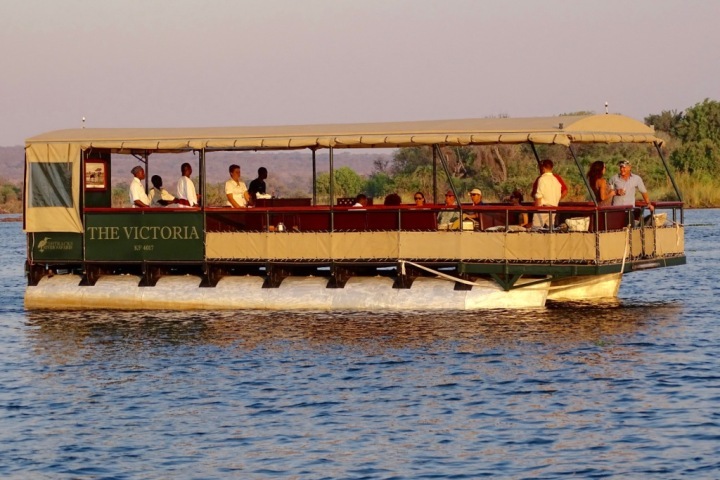 The boats have a simple yet beautiful interior, and the dinner cruise has been voted as one of the best-valued activities in Victoria Falls. This immaculate catamaran which is the third vessel in the Zambezi Explorer Company’s fleet gives a nod to history, her canvas ceilings, copper basins, and classic teak counters transport guests to a bygone era of safari romance. 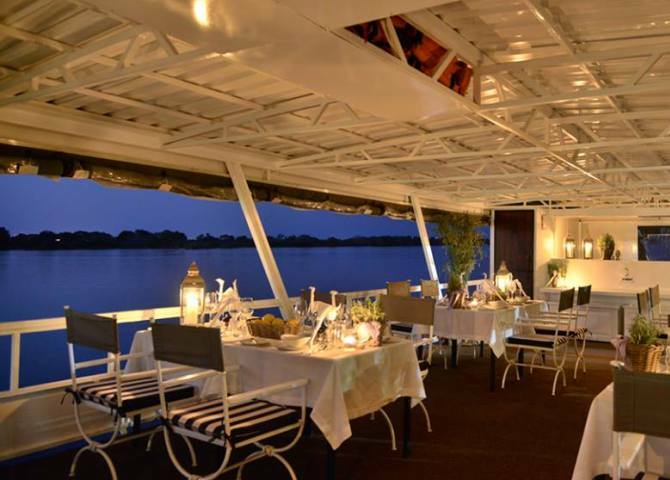 Ma Roberts has been exploring the Zambezi for 20 years, but has recently undergone a major refurbishment and is now available exclusively for sunset and dinner cruises. The vessel has two levels, and from the top deck, guests can survey the islands and surrounding riverine as the boat glides upriver. The on-board kitchen serves guests with freshly prepared snacks during the sunset cruise, and a four-course dinner thereafter. Due to its recent refurbishment, the attention to detail, the upper deck and its fine dining menu, the Ma Roberts is probably the first choice for a sunset and dinner cruise.